For other people with similar names, see Joe Hill (disambiguation) and Joe King (disambiguation). King is the son of authors Stephen and Tabitha King and the brother of Owen King. Hill was born in 1972 to authors Tabitha (née Spruce) and Stephen King. He was born in Hermon, Maine and grew up in Bangor, Maine. His younger brother, Owen King, is also a writer. At age 9, Hill appeared in the 1982 film Creepshow, directed by George A. Romero, which co-starred and was written by his father. 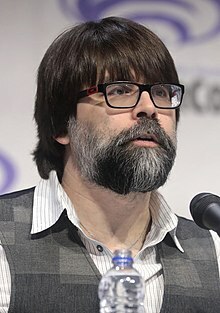 Hill chose to use an abbreviated form of his given name (a reference to executed labor leader Joe Hill, for whom he was named) in 1997, out of a desire to succeed based solely on his own merits rather than as the son of Stephen King, one of the world's best-selling and most-recognized living novelists. After achieving a degree of independent success, Hill publicly confirmed his identity in 2007 after an article the previous year in Variety broke his cover (although online speculation about Hill's family background had been appearing since 2005). Hill is a recipient of the Ray Bradbury Fellowship. He has also received the William L. Crawford award for best new fantasy writer in 2006, the A. E. Coppard Long Fiction Prize in 1999 for "Better Than Home" and the 2006 World Fantasy Award for Best Novella for "Voluntary Committal". His stories have appeared in a variety of magazines, such as "Subterranean Magazine", "Postscripts" and "The High Plains Literary Review", and in many anthologies, including "The Mammoth Book of Best New Horror" (ed. Stephen Jones) and "The Year's Best Fantasy and Horror" (ed. Ellen Datlow, Kelly Link & Gavin Grant). Hill's first book, the limited edition collection 20th Century Ghosts (published in 2005 by PS Publishing), showcases fourteen of his short stories and won the Bram Stoker Award for Best Fiction Collection, together with the British Fantasy Award for Best Collection and Best Short Story for "Best New Horror". In October 2007, Hill's mainstream US and UK publishers reprinted 20th Century Ghosts, without the extras published in the 2005 slipcased versions, but including one new story. Hill's first novel, Heart-Shaped Box, was published by William Morrow/HarperCollins on February 13, 2007 and by Victor Gollancz Ltd in UK in March 2007. The novel reached number eight on the "New York Times" bestseller list on April 1, 2007. When he began writing, Hill was well aware of the inevitable comparisons that would arise between his own work and that of his father, Stephen King, with the name "King" being synonymous with horror fiction. Stephen King had himself used a pen-name, Richard Bachman, after he had become well-established, explaining later in the short essay, "Why I Was Bachman" that he felt he had to know whether he could "re-achieve" success as an author purely through the quality of his writing, as opposed to what perceived as the "brand" that had become established through his own name. Joseph King chose to take the same approach; although many readers (and most reviewers) are now aware of the connection, his fiction has been widely praised, and many critics have stressed their own objectivity and lack of preconceptions when reviewing his works. On September 23, 2007, at the thirty-first Fantasycon, the British Fantasy Society awarded Hill the first ever Sydney J. Bounds Best Newcomer Award. Hill's first professional sale was in 1997. Among unpublished works is one partly completed with his father, "But Only Darkness Loves Me", which is held with the Stephen King papers at the Special Collections Unit of the Raymond H Fogler Library at the University of Maine in Orono, Maine. Hill is also the author of Locke & Key, a comic book series published by IDW Publishing. The first issue, released on February 20, 2008, sold out of its initial publication run in one day. A collection of the series in limited form from Subterranean Press sold out within 24 hours of being announced. Hill's second novel, Horns, was published on February 16, 2010. A film based on the novel was released in 2014. NOS4A2, his third novel, was published on April 30, 2013. The novel peaked at number five on the New York Times Best Seller list. Hill's fourth novel called The Fireman was released on May 17, 2016. It entered the New York Times Best Seller list at number one, making it his highest-ranked novel. In 2018 a collection of four short novellas was released, Strange Weather. Horns was made into a movie in 2013 by director Alexandre Aja with Daniel Radcliffe as Ig and Juno Temple as Merrin. In 2019 In the Tall Grass, co-written with his dad, will be released as a Netflix Original. Filming for the Locke & Key TV series, also by Netflix, will begin in the middle of January 2019. AMC is working on a TV series of NOS4A2. As announced by Shudder, the upcoming series reboot of Creepshow will contain an adaptation of Hill's short story "By the Silvery Waters of Lake Champlain". The series will air sometime in 2019. Full Throttle (2019; collection) – First talked about in 2018 Facebook Live event. Up the Chimney Down (2020) – First talked about in 2018 Facebook Live event. Below is a list of Hill's short fiction which has been reprinted. "Pop Art" was reprinted in 2007 by Subterranean Press as a chapbook featuring illustrations by Gahan Wilson. As well, 52 lettered (A–ZZ) hard covers and 150 numbered soft covered chapbooks were signed by Hill. "Fanboyz", a comic script, was written for Spider-Man Unlimited 8 (2005). The story was illustrated by Seth Fisher. "The Saved", first published in The Clackamas Literary Review in 2001 and also as part of the bonus material included in the 2005 deluxe slipcased edition of 20th Century Ghosts, was reprinted in December 2007 as part of PS Publishing's annual Holiday Chapbook series, available, free of charge, to subscribers of the quarterly magazine Postscripts. "Thumbprint", first published in Postscripts #10 in 2007, was reprinted as a chapbook in summer 2008 to accompany the anthology Subterranean: Tales of Dark Fantasy published by Subterranean Press. Hill was selected to serve as the guest editor of the first (2015) volume of Houghton Mifflin Harcourt's series The Best American Science Fiction and Fantasy. The Fireman was referenced in Episode 0 of the podcast Point Mystic, which also featured Joe Hill's voice and likeness. ^ Monroe, Justin. "Interview: "NOS4R2" Author Joe Hill Talks the War on Christmas, Movie Adaptations, and Mark Twain's Twitter". ^ McClintock, Michael Fleming,Pamela (April 6, 2006). "WB keeping King kin in 'Box'". ^ Excerpts from interview in July 2006 "Locus"
^ "fiction". joe hill fiction. Archived from the original on January 12, 2014. Retrieved August 18, 2013. ^ Fire, Larry (July 23, 2011). "Joe Hill On NOS4A2, The Walking Dead & Future Projects | THE FIRE WIRE". Larryfire.wordpress.com. Retrieved August 18, 2013. ^ "A place to get news on Joe Hill's novels, short stories, comics, films, and other projects". Joe Hill Fiction. August 1, 2013. Retrieved August 18, 2013. ^ "THE FIRE WIRE Exclusive: Interview With NOS4A2 Author, Joe Hill". ^ "Exeter author Joe Hill earns Top 10 honor". seacoastonline.com. ^ "A Little Silver Book of Sharp Shiny Slivers by Joe Hill — Signed Limited Edition". borderlandspress.com. ^ Hill, Joe. "Pop Art by Joe Hill — Subterranean Press". Subterraneanpress.com. Archived from the original on February 5, 2012. Retrieved August 18, 2013. ^ "Houghton Mifflin Harcourt Announces The Best American Science Fiction and Fantasy". Houghton Mifflin Harcourt. February 21, 2014. Archived from the original on January 9, 2015. Retrieved January 9, 2015.